Fun fact: Small things can actually be pretty great. Want proof? Check out these Starburst Minis. They’re just like the Starburst candy you know and love, only smaller and unwrapped. Starburst candies are packed with a variety of great-tasting fruit flavors and a deliciously soft, chewy texture to be enjoyed anytime, anywhere. Like, say, right now. Or right…now. Starburst Sours Minis Candy contains cherry, strawberry, blue raspberry, and watermelon flavors. Just like the Starburst candies you know and love, only smaller and unwrapped. Perfect for parties, sweet snacking, or as a flavorful after-dinner treat. 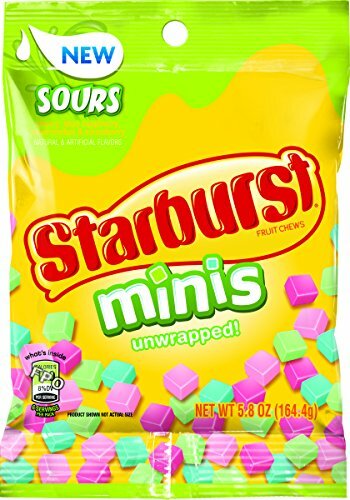 Starburst Sours Minis contain cherry, strawberry, blue raspberry, and watermelon flavors. Fruit-flavored, mini candy chews with a soft, chewy texture. Package includes 12 individual bags, 5.8 ounces each.